This weekend I had the unique experience of getting all teary at the sight of a particularly nice hanging garden. This may just indicate that I’m becoming increasingly English, but it was more likely due to my being wound up by a frankly amazing new play, which caused me to see deep beauty in some hanging baskets – or, more to the point, to the human beings that put energy into creating them. 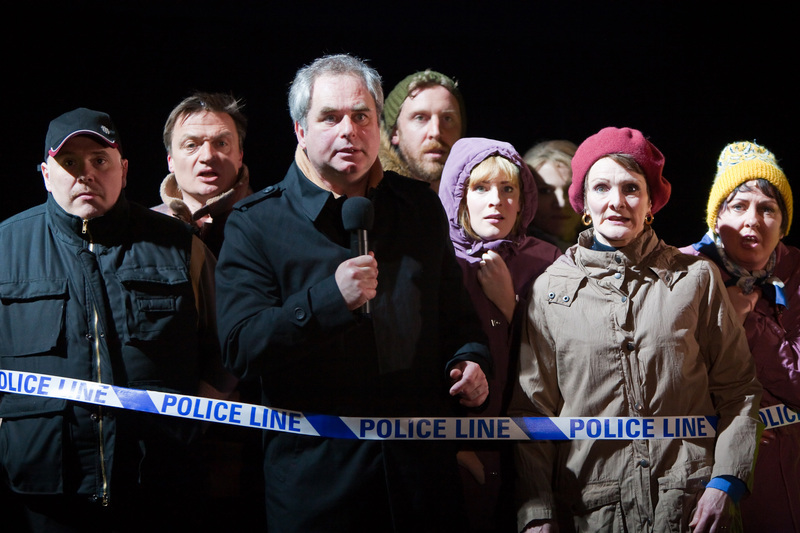 The show was “London Road”, which is playing on the most intimate stage at the National Theatre, the black box of the Cottlesloe. (The National Theatre actually commissioned the creation of the show; it was news to me that the National does edgy stuff like this.) Caroline and I had gone in with high expectations: it is certainly the best-reviewed show I can recall in four years of reading UK reviews. Critics here tend to use their fifth star sparingly; if any show gets even two or three five-star reviews in total from London’s pro reviewers, that marks the show as something special, a once-in-a-season thing. 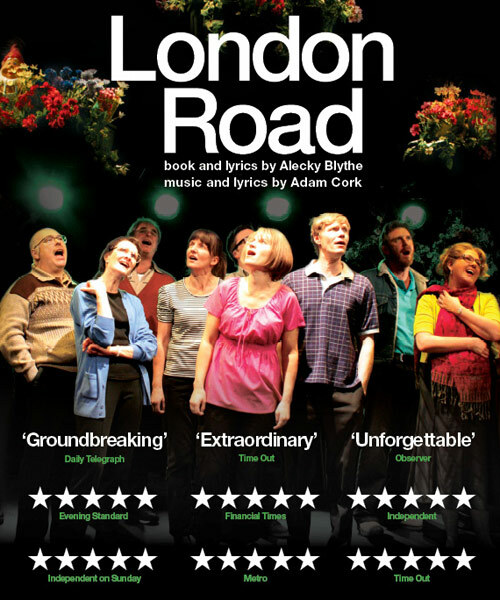 London Road’s number of five-star reviews is nine and counting. That said, our expectations were tempered a bit by what little we knew in advance about the subject matter and structure of the show. It tells the non-fictional story of a group of neighbours in the town of Ipswich, and how they were affected by the murder of five prostitutes there in 2006. The script was built from a collection of interview transcripts, lines from which are repeated verbatim by the actors – and, on top of that, most of the lines aren’t spoken, but rather are sung. To say “It shouldn’t work, but it does” would suggest that the team behind this has built some contraption which holds together, perhaps just barely – and that while they should be lauded for seeing the noble experiment through, they shouldn’t imagine that they’ve in any real way expanded the boundary of what live theatre can be. But this would be wrong. For me, at least, they have in fact expanded the boundary of what live theatre can and should be. In those first few scenes, the characters are just finding their feet with each other. Thus, our first image of the community is one of people reaching out to their neighbours, and trying to make sure they’re each doing all they can to help each other through a terrible situation. However, once this impulse is established, the lens pulls back a bit, and the remainder of the show is not all feel-good, chin-up stuff. Obviously the core drivers behind the sudden good-neighbourliness – the existence of drug addiction and prostitution, and five people being murdered – are not exactly great advertisements for humanity as a species. By the end of the show, I had adapted my initial assessment, and decided that if aliens came, and we had two hours to explain to them some of the complex, heartening, sad, uplifting, depressing aspects of being human (all wrapped in the most heartening thing of all: the fact that someone has taken human speech about a terrible act and wrapped it in music and made a beautiful piece of art out of it), we could do worse. It’s not always pretty, but this is what life as a human being can be like. For me it’s that richness that takes this well beyond a normal show. There are so many different layers at work, and the end result is so effective at catching your eye and heart with different things in different ways at different times. Building on the transcripts, you then get the interpretation and amplification of the actors. In each of real people they’re portraying, you learn to recognize, care about and finally forgive them for the personas they’re trying to display to the world, the relationship dynamics they’re unwittingly laying bare. One husband, interrupted by his wife throughout an early scene, seems henpecked. The second time it happens, he starts to seem pathetic. By the third time, you begin to understand that this may just be a mode of interaction that, no matter how it may look from the outside, happens to work for them. And then, on top of the actors’ choices, you get the layer of emotion and narrative shape that comes with the choices made by composer Alex Cork with the music. To the blank slate of an interview transcript, you get the ability to add a chord, and suddenly it’s hopeful or melancholy or dissonant (though dissonant chords are rarely fallen back on). Then there’s rhythm – langourous/pensive, plodding/militaristic, fast/frantic. And then, finally, the occasional structure of verse and chorus, which lets Blythe and Cork lift out phrases they think most effectively express the point of the character or scene, and make that phrase into a totem by repeating it. As an example, a remark by one of the reporters who stake out the street for establishing shots for the nightly news, about the neighbours – “They like a good moan” – goes from being a passing remark to, through repetition, summing up the media’s attitude towards the people inside the houses they’re filming. That typically comes from a combination of plot, dialogue, and character. But those are all elements of constructing a script from whole cloth which weren’t available to Blythe, bound as she was to her source text – and anyway, she wasn’t looking to produce a thriller. I do wonder if I’ll remember it more deeply than shows which, despite some memorable moments, didn’t really expand my experience. I suspect the space London Road will occupy in my memory is more like that of an absorbing novel; something that produces less of a rush but seeps into you more deeply. And, in the long run, it may change what I define as a five-star show, and what I look for in the shows I see. This entry was posted in All reviews, Theatre and tagged National Theatre, Play with songs, prostitutes, verbatim. Bookmark the permalink.